I’m going to be 60 this year. As I approach this milestone, my only real emotion is gratitude. I’m very grateful for the life I have and for my family. I’m grateful that my dad’s health is good, and I’m beyond grateful for this amazing career called blogging. One of the benefits of growing older is that our perspective changes…either because of the choices we have made or the lessons we have learned along the way. When I look back at my 20 or 30-something self, I can clearly see that I’m a different person. Sometimes these changes are hard. I honestly WANT things to stay the same…but we all know life doesn’t work that way. So as we grow older, the only way to keep it together is to be kind to ourselves. We need to breathe and we need to realize that different isn’t always bad. As I’ve said before, we need to grant ourselves grace. I’ve shared the following thoughts before, but I needed a refresher, so I thought you may need one too. These are things that I’ve realized in the past few years…epiphanies really. Mindsets that make life easier and tips for coping. These are small things that may make life better and happier. *And because I can’t bear to publish a post with no pictures, I’m sprinkling a few of my favorite images here and there. Tip #1 | It’s OK to slow down. One of the things that has been hard for me to adjust to as I’ve gotten older is that everything I do seems to take a little longer. I can’t run through the grocery store in twenty minutes anymore. I have to allow at least an hour (or more!) I can’t do the laundry in an afternoon…sometimes it takes a few days. I used to get so frustrated with myself, but that only made matters worse…so I started to just accept it and allow more time for everything. When I did that, things got much better and I didn’t feel like I was always trying to catch up. So…give yourself a break. It’s definitely OK to slow down. Tip #2 | It’s OK to say no. I feel like, for some avenues of my life, I have paid my dues. For my whole life, I have done countless things out of obligation…or because I was trying to meet the expectations of others. A few years ago, I just stopped. I don’t feel obligated to do much of anything anymore. I do what I want and spend time with the people I love. There’s a lot of talk about moving out of your comfort zone…and I’m all for challenges and growing. Here’s the deal though…it took me a very long time to find my comfort zone, and now that I’ve found it, I have no desire to look any further. I have accepted myself for who I am. That person is imperfect, a little shy, and likes to stay home. I no longer try to be someone I am not…and I’m much happier. So say no when you want to…and don’t feel guilty. Tip #3 | It’s OK to let go of friendships. I don’t want this tip to be taken the wrong way…I love my friends and could not imagine my life without them. Sometimes though, friendships run their course. Life has a way of changing us and if a friendship isn’t working anymore, if what you had in common is gone, I think it’s best to let go and move on. Let go before the resentment and guilt starts to weigh heavy on your heart. When I left my job after 17 years of working with the same people every day, I was sure we would all keep in touch. I wanted, more than anything, to still be part of their lives. Well, as you can probably guess, that didn’t happen. I have kept in touch with just three people. I felt guilty and sad for a long time…but I finally let go and I felt so much better. I wish I had not put myself through that, but it was a good learning experience. So…let go if it feels right. Tip #4 | It’s OK to ask for help. This is, to this day, one of the hardest things for me to do. I don’t like to ask for help. I don’t want to be a bother, and I certainly don’t want to appear that I don’t have my act together. Sometimes, we just have to get over ourselves and take time for a reality check. When we are faced with something overwhelming, or really hard, it’s PERFECTLY OK TO ASK FOR HELP. I know this now and am getting better at it. I know I don’t have to do it all, all by myself. It’s taken a lifetime for me to realize that, but now that I do, I am more relaxed and life seems a little easier. So…when the road looks long and winding, don’t walk it alone. Tip #5 | Reminder: this too shall pass. I’ve saved the best for last, and it’s not really a tip. It’s more of a reminder that no matter what happens, or how utterly horrible things seem, it will get better. Every family has drama, and if someone tries to tell you differently, they are flat-out lying. No family is perfect…no relationship is perfect. We get hurt and we get mad, but those feelings don’t last forever. Thank God for that. Time takes care of feelings and emotions that cause unhappiness. Even just one night can make a difference. “Sleep on it” is sometimes the best advice ever. Some people don’t believe this, but I am not one of them. With time comes perspective, and with perspective comes forgiveness. Neither happens overnight, but with time, both are attainable. So…definitely not my usual craft or dessert! I hope I didn’t get too deep, but I really wanted to share these things and this seemed like the perfect opportunity. It’s food for thought for all of us. It really doesn’t matter which side of 60 you are on, what matters is that either way, you are living your best life. Happy birthday! I’ll be turning 60 on February 10th. I sometimes wonder how did I get to this age, when I just graduated high school a few years ago! Thank you for sharing Ann! Happy Happy Birthday! Thank you so much for sharing your tips and insights. I’ve always had trouble with #2, but as I too look toward my 60th year, it’s finally getting easier to say no. Happy Birthday! Thanks for your “words of wisdom”. They are meaningful at any age. Wishing you a very Happy Birthday! Thank you for such a beautiful blog. Happy Birthday and welcome to the 60 something club! It goes so fast, but I wouldn’t want to go back, except for the aches and pains. Thanks for the gorgeous printable . It has to be one of my favorites! Now that was a GREAT commentary. Happy Birthday and thank you for sharing. Love this! Absolutely the truth! Turning 65 this year. Lots of changes coming as I plan on retiring after 27 years of teaching. Thanks for the encouraging words!! Thank you for sharing! I, too, will be turning 60 this year. Perspective. That’s my word for 2019. Lets’s Enjoy this side of 60!! I so agree with you. It takes time to get to this point in our life and we should enjoy, not feel guilty and miss out because of the guilt. Love your blog so much, keep it coming! I have said for some time now that my mantra is “this to shall pass”, it might take longer then we want or end up with a different ending then we want but it does pass. I loved seeing that in your post. I turned 60 last year and my body is starting to show the signs of getting older such as parts hurting when I do things that didn’t use to bother me at all. Well I hope and pray that turning 60 for you is a special blessing in all areas of your life. My 60th birthday was yesterday…perfect timing. I have a few regrets, mainly that I wish I had given my children more of me. Only to make sure they know how very much I love them. Happy birthday to you, sweet Ann! You could be me, except I’m 72. Your words are encouraging and inspiring. It seems that the start of each new decade brings a much-needed and resetting introspection of one’s self. You’re absolutely right that we need to be kinder to ourselves as we age. In turn, that brings the ability to be kinder to others, something greatly needed in these times. Happy 60th; you’re just a youngster. Thank you for sharing these thoughts. Sometimes it’s not easy to share things like this and I applaud you for that too! Very well said Ann… I feel very much like you. We all need to be a little kinder ..to ourselves!Women are pleasers by nature but our needs are important too! Happy Birthday! Thank you for sharing! I too am turning 60 this year. Loved your tips. Something to think about. You are a beautiful soul! I am so glad I found your blog. You ALWAYS brighten my day! And……..the jiffy cornbread bake is heavenly! Loved this post! I’m in my later 60’s and this post is so true. Having good health is huge. Celebrate this new chapter in life❤️❤️. I loved everything that you had to say. You were able to perfectly verbalize so many things that I’ve been thinking about. I’ll be 69 in April & I have a very close relationship with both my daughters & their families. I have 2 beautiful grandsons who are both turning 10 this year. (My daughters were pregnant at the same time, so the boys are more like brothers than cousins. They’re 3 months apart to the day.) They are wonderful to me, but unfortunately I’m one of those people who likes “instant gratification.” They do anything I ask, but I don’t always like waiting. I fell of my counter in early September because I couldn’t “wait” for help. And I’m still paying for it, physically. I can relate to so many of the things that you said about friendships as well. And, it’s nice to know that I’m not the only person who gets tired & can’t do as many things as she wants to as fast as she wants to. Anyway, I wanted to thank you for your words of wisdom. And “Happy Birthday” to you! Ann, I am just a few weeks from my big 6-O also, and your post really rang true for me, as well. These last couple of years have had some really difficult times, but I feel like I’m on the edge of some new beginnings. I have always enjoyed your posts, and I look forward to moving forward through our 60’s together! Happy Birthday! Like you I’ve retired and am now 61 though. I’ve started to learn about blogging. Your Tips were perfect. Thank you. I, too, just turned 60. I thought I would be in a different place at this time. We moved upstate from LI and am realizing I am not thrilled with cold and snow. I like to tinker outside in the garden and do projects, but “Summer” is short here. I know, I should be thankful…I have my health, I’ve lost some weight, I’m financially well and only work when I feel like it. I volunteer at my local fire company, having recently completed Basic Exterior Firefighting Operations. I also belong to two “Ladies Auxiliaries”. I just feel like “I should be doing something”…April will come sooner or later, along with some warmer weather, and I will feel better. Thanks for reading, if you still are, lol. As always I look forward to your emails and I found today’s especially helpful. I am sitting on the upper side of 60 and have these thoughts so often. It is comforting and encouraging to know that I’m not alone and that it’s okay to allow these changes to take place without my constantly trying to work against them. Thank you for posting so that all of us can look at life differently and feel peace. Thank You for your heart felt words , they really spoke to me . I’m not far from 60 myself turned 58 in December I want to be greatful everyday for All the thing we take for granted. Find Joy in the little things like your blog it makes me smile, Thank You Wishing you Peace , Love , Health and Happiness. Happy 60! Love the thoughts. I’m on the tail end if 60’s and I can’t lie all of a sudden you wonder where has time gone? I’ve waited 13 years for my husband to retire…13 years he’ll never have but I hope we’ll get to gave together… One can only hope…😄 celebrate each day! Definitely not your usual craft or dessert, but this post really spoke to me. I’m 63 years old and recently retired from being self employed. I’m still working on getting into my new groove. I was self-employed working from home, but it is still an adjustment. I’m working on removing the constant messages I’ve had in my head for years “hurry up”, “you should be working”, “you don’t have time for this”. After several months these message are starting to disappear and I’m learning to slow down and enjoy….and do fun things like read posts from my favorite blogger. I admit enjoying your blog partly because you are my age and not one of the youngster bloggers. Great post Ann! I’m in my sixties but I don’t dwell on the number, never have. Your #2 is one that resonates with me- a little shy, like to be home – something I’ve had to justify with people around me. Having lived a good part of my life out of my comfort zone is for sure the reason I feel this way now. “Let’s keep in touch” is something that has many times over been a big disappointment. If I say this to someone, I actually mean it and had to find out the hard way its not the case for everyone. A difficult lesson for me. All this to say I’m happy to be the age I am and thankful for my health and family. Happy Birthday Ann! I love & enjoy your blog very much ! Thank You for ALL the inspiring words & ideas !! Thank you Ann for sharing these nuggets. I couldn’t agree more with your perspective. I so appreciate your aesthetic and gift for sharing it with us. Hi Ann, my epiphany came about six years ago. Yes, it’s ok to give ourselves a little grace. I was always the one to plan all the get togethers, family reunions, etc. Not anymore! So none of it happens and I’m A-OK with it. I’m 64 and I love my life. I have two daughters and one granddaughter and they fill my life. Yes, I’m giving myself permission to live my life the way I want to! Plus, I have an absolutely wonderful husband of 42 years! Happy birthday, Ann. Love your blog. As I was reading this post, I related to each and every tip. I will be 64 in August and it seems that I began to put life into perspective at age 60. Thank you for all the “tips” you post, regarding both life and decor. Wisdom learned from age. I love each of your tips. Happy 60th. When the big day arrives, HAPPY, HAPPY 60th BIRTHDAY TO YOU! You’re beautiful and your talents and ideas spark joy into my life and home. You know what? You just hit the nail on the head! I turned 71 this year (still don’t know how that happened😉)and I feel exactly the same way. Let go of what doesn’t give you joy because God wants you to be a joyful person. Do what you can to keep up with what needs to be done, and for your health and ask for help with the rest. Enjoy the years you have left, don’t waste them on regrets and stress and things or people who steal your joy. Love deeply those that do give you joy and have some dog gone fun when you can and while you can! Thank you for this post. It needed to be put out there. Happy birthday and I hope you have a wonderful year. Life for me at 65 is still very busy; however, I do feel I’m living my best life and I don’t want to miss a single minute of it. Taking a few moments out to read your blog is time well spent. Thank you for sharing. Thank you for sharing your positive, caring and supportive message! I agree about letting some friendships go. I retired about 2 years ago and I felt the exact way wanting to stay in contact with all my friends at work. It’s not realistic yet it was making me feel guilty. Between retiring and moving away it has been a challenge to stay in touch. It helps to read your message that others go through this and it’s ok to move on. Btw Your blog is so lovely with beautiful ideas and images. I can’t help but to feel upbeat and creative after reading it. Just a little thing but I made a point to get fresh flowers to brighten up the kitchen, helps to brighten up the place after taking down all the Christmas decorations. I agree with all your tips, especially #2. At a certain point we have to remember to take care of ourselves and do what makes us happy. I am new to your blog and love it. I’m on the other side of 60. Everything you have said is so true! I found the same things after I retired. I just admire you so, Ann. I feel we could be good friends. Wishing you a very happy birthday, Ann.! Thank you for sharing these truths from your heart. I’m 67 and can relate to every piece of advice you’ve shared, especially ‘this, too, shall pass.’ I look forward to your blogs and appreciate the honesty & genuine voice w/which you write. No pretenses, no perfection…just a willingness to share what you’ve learned along the way. And in that way, you’ve become a dear friend who I’ll probably never meet face-to-face, but rather heart-to-heart. Thank you, Ann. 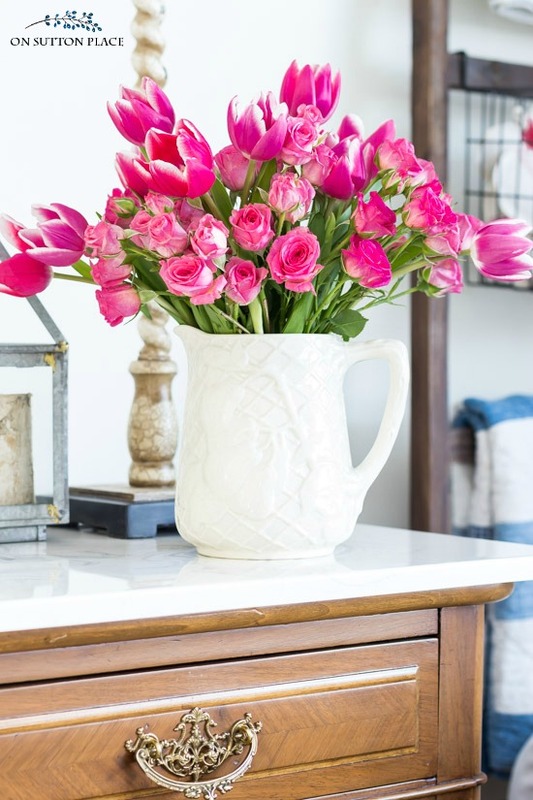 Thank you so much for sharing with us your wisdom, grace and beautiful blog! Ann, I love and live by all of your tips! When I turned 60 my husband and his mother were both having major health issues and my birthday got lost in the business of taking care of them. When there was a moment to breath I realized not much had changed and the dreaded day had slipped by without much notice! The previous concerns about growing older and turning 60 were not even an issue when the time had come! What I learned from this is: 1. It’s ok to reflect. 2. It’s ok to “wallow” in “it” for a little while. BUT… 3. Tip #5 | Reminder: this too shall pass. 4. So… Life is what you make of it! Happy Birthday and many, many more! Your post today was beautiful. Don’t ever stop sharing your thoughts and feelings with us. I will soon be 75 and related to all you said. Beautifully and honestly written Ann. I recently turned 67, still work part time close to home & enjoy it. My husband recently entered into semi-retirement due to the loss of his job, and completed training to become a school bus driver. Not sure how much longer we will work… Time will tell, but we will certainly have fun along the way whether we’re still working or not. Our favorite place to be is at home, and I agree with everything you have listed above. I so enjoy your blog and feel that if we met, we would be good friends. Thank you for your decorating ideas, recipes, shopping ideas, and printables (I’ve framed quite a few of those). We share the same love of historical period shows. PBS is my favorite TV station. Turning 60 was a ‘special’ time for me, as I hope it will be for you as well. My family gifted me with a weekend birthday celebration that included an appointment with a photographer to have our family pictures taken, a breakfast buffet with the entire family, including our grandchildren, and a fancy dinner out with our 3 children and their spouses. I truly felt loved for my birthday! So here’s to turning 60! May it be the beginning of a fulfilling chapter of your life! Enjoy! GREAT post – very well written and spot-on. Oh! Thanks so much for sharing, Ann. I, too, will turn 60 in November of this year and I have much the same perspective as you. I am still working in the education business as an instructional technology coach and I am struggling daily with the way education is today compared to my vision of the way education should be. My husband and I are following the suggestions that are given everywhere for what should take place before you retire. 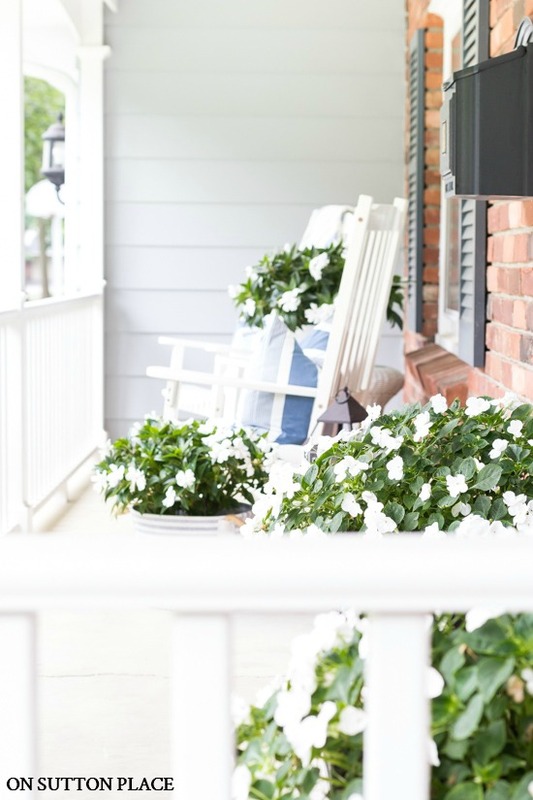 We have been updating things around here – replacement windows, new porch rails, paint the places that need painting, etc. You really hit the top 5 on the head, I think. Some are harder to embrace and adapt than others – my husband has struggled with the slowing down piece and I have struggled with the asking for help piece, for example. Yet, time does have a way of allowing us to see most everything as a blessing and go along with the ebb and flow of life. I guess, your sharing provided me with inspiration and hope today when I really needed it most! Can’t tell you how much I love this post. Sixty is a while past for me, but every word you have written is true and remains so for every year that passes. You two of my favorite sayings in #5. My children have heard that “things will look better in the morning” and “this, too, will pass” countless times and I have learned over the years that both are so true. Enjoy your birthday and all the days to come. Your blog is my very favorite. I am so glad you wrote your blog! I feel the same way , Thank You!!! Wonderful post! Today, I will read this to my Mother and I Know it will help her and make her feel better. She is 89 and nothing slows her down…until now, a set-back. So, thank you! Ann, thank you so much for sharing your thoughts on what your life has taught you…….you seem content with what you have lived and learned. Growing older is a process I am learning! Enjoy each day I have learned! Not bad advice pretty much any time of life. I’ll be 65 this year, in about a month and a half actually. It has it’s good points and bad. I’m very thankful for my life, and especially my family. without them the past year would have been harder than necessary. They have helped me out and shoved me forward when I needed to go. I moved in 2017, halfway across the country back to the state I was born in. Loved where I was living but it was time to go home. Someone I had been taking care of for over 20 years became seriously ill, required hospitalization, an operation, and is at the end of life with hospice care, something that was totally unexpected. He is being taken care of by other family as I am not his guardian, which is frankly a relief as it had become one more burden for me. My husband died in February, a serious blow. It wasn’t a surprise, so much, his health had been going downhill the last three years, but I had hoped for at least a few more years with him. The main reason for moving back was so we could spend time with family and have some help closer at hand. He went peacefully in his sleep and at home, which is what he wanted. The rest of the year has just been dealing with that and navigating the morass of paperwork required. Don’t even get me started on taxes and social security. And this year is dealing with Medicare and trying to get my driver’s license again. I had given up driving for 20 years because I absolutely hate doing it, but it is not a choice anymore. I live in a big town and have to get around without depending on family, and an inconvenient bus system. And the possibility of needing to find a part time job. My mother is reaching the point of not being able to drive and I’m the only one really able to take care of her now. I suspect there is going to be a lot of family drama this year. But, on the good side, I get to be around my kids, and be involved with my grandkids, and see more of my siblings, something I enjoy for the most part! (Family drama is one of them, but we all have that one person in the family so…) There is a great deal to be thankful for each day and I remind myself of that when I get tired. And, to be honest, reading your blog is one of the better reasons for the internet! Thank you for sharing. I agree and wish we all could have learned these things a littler earlier in life. Maybe we can pass onto others our age or to our children as they enter into adulthood. Ann, You are so right with your comments about evolving as we age! I am just two years from turning 80 and often reflect back on where life has taken me and the changes I have gone through . I have three grown children we adopted from the same family and each has some major mental health issues that came along as baggage. I have done my best and gave everything within me but could never really heal their problems or the damage that was done early in life or genetic. I too have parted from some friends who for one reason or another moved on. God alone guides us through this journey with it’s ups and downs. He can show us how even the difficult times can bring blessings. One day at a time, now at a much slower pace, we can choose to stop and smell the roses and still be of service when we hear the calling. Thank you for your blog and the beauty it brings to others. Happy Birthday Ann! Great reflections and so true in many ways. I decided I was not making resolutions for 2019 but intentions. Starting each goal with, “I intend to….”. It has really helped me succeed. One of my main intentions is to no longer overbook my days. It is difficult being the social person I am to just sit and relax, but the more I practice the calmer life is. Welcome to the 60’s! Love your posts. Such an enlightening post and very well said. I whole heartedly agree. 60 passed by quite a few years ago and it isn’t so bad! Great thoughts! I recently turned 70 and one of my biggest frustrations is how I’m slowing down. But it’s a part of life! I always enjoy your posts! And Happy Birthday! Thank you! There must be something magical about entering our 60’s. It brought me persoective, clarity, peace and comfort with who and where I am too. I also turned 60 this year and I found that I have already began the same process. Thank you for putting it into words and sharing. Welcome to the club and it’s not all that bad, although as a mom of a 21 & 24 year old (had my youngest at 40!) I do feel it more than any other birthday. Your post is such a sweet reminder and I agree with all of it, helps to keep us young. Just recent follower of your blog and look forward to your posts. Many thanks for sharing … and early HBD!! I’m not alone…I’m 66 and my boys are 25 and 28:) They keep me young…just so blessed to have them. I wish I had realized some of these things when I turned 60. I’m still working full time and God-willing, I will be for a couple more years. What I’ve learned is that some many things just aren’t that important anymore. Family, health, and friendships mean more to me than anything. This decade may not be as good as my 50’s but I’m not going down without a fight. Happy Birthday Ann! Happy Birthday, Ann!! I enjoyed today’s post. Thank you, Ann, for sharing your wisdom. I am 63 and still teaching full time and struggling off and on with age-related changes. Your tips are so helpful. I have come to some of the same conclusions but it is good to see them in print. I especially appreciate your first tip about things taking much longer to do, because I feel very impatient about it but I need to allow myself the latitude to slow down. I so appreciate your thoughts. Ann Ann Ann, you are so right on the money! I too have just turned 60. I had stopped my nursing career almost 10 years previously, and I also wanted to maintain those friendships, but as you say that didn’t happen. I suppose mostly because of the variance of shift work, but I also know I just didn’t want to hear about all the “drama”. So I too, had to stop and look at myself, and decide who I wanted to be. I was always a “busy” person, and I enjoy my alone times very much, so reading, gardening, crafting, cooking became my life. My husband and I recently made a move from a large city to a very tiny rural community for his job. My family were all very worried about me and how I would adjust. Well guess what? I love country living!! I know longer worry about crime, traffic, ……. my worries now consist of finding routes to and from the closest Walmart ( 50 minutes) , how fast I can get a new book on my Kindle from the library( months for new releases), and what to do with all the fresh fruit and veggies that these wonderful people bring us!! So yes, my life is slower, I could choose to be lonely, but I choose to help out by volunteering at a critical access hospital, and I have found reading your blog and others, I have learned how to can, make body scrubs…. and am mostly having the time of my life and cannot wait for my hubby to retire! So enjoy this next decade, I know I plan to. Now when our children come to visit they see a mom and dad so much more relaxed and playful! You are so right! I just turned 65 this year, and have developed a small health problem. For the first time in my life I had to ask them to do a few things for me – and they were delighted. Their answer was, “it’s about time you let us take care of you!”. I loved this post. In fact I’m going to print it out and save it. Words of wisdom. Just last week I had a wake up call…a mini stroke. No lasting damage but it was a frightening experience especially because I didn’t have high blood pressure or any other risk factors that are usually associated with a stroke. My husband and I ride our bicycles 8-10 miles 2-3 times per week in the spring, summer and fall. I thought I was in good health for my age (74). It happened so suddenly and with no warning. It made me realize that each day is precious and tomorrow can’t be taken for granted. All of the things you have written about today are very true. I am so blessed with a loving husband, a comfortable home, good friends and too many other blessings to list. I have always been an overachiever and I just need to remember to slow down, be good to myself and enjoy and appreciate the life that I have. Thank you for sharing your thoughts. They could have been mine. Dear Ann,I think we were separated at birth,I feel I am reading about myself !My birthday was this week,67 and another year grateful.Everything you wrote rings true, I consider myself a work in progress.Your blog today was beautifully written.Happy early birthday, hope it will be one of your best. Great advice for those of us on the older side of 60! I’m 37 and I still have a horrible time asking for help. I’m pretty sure if I’d died a few years ago my tombstone would have read “Never Asked for Help”. I so enjoyed reading your post this morning for I am also turning 60 this year. As I read each of your thoughts I see myself. With age comes wisdom and discernment. We have walked down many roads and circumstances that have brought us to where we are today and I believe we are living deeper richer lives because of it. I believe with the knowledge we carry with us we have much to give to those around us. I turn 60 tomorrow. I’ve learned much the same as you. Definitely only feeling gratitude for my life. About 5 years ago I learned the most important thing to date. Happy birthday, Nancy. I turn 62 tomorrow. Hope your day is filled with the people and places you love the most. A great reminder of the important things, thank you, I needed that reminder. This resonates, especially saying no without guilt. It feels so good, and is something I try to teach my students every day. This post made my day. Thank you. I’m a new follower, and I’m loving your vibe and printables. I have your January iPhone background on my phone as I type. Thanks! Lovely words to reflect on and apply to where I am in life. I will be 58 in a week and still feel pulled in many different directions some days. I hope to reflect on your post all week and start making some healthy changes. Thanks! Your reflections are beautiful and so on point. I’m 61 and deal with all of these issues daily. I know all of these things but get so caught up in daily stressers. This was a beautiful reminder for me to accept myself and just breathe. Thank you! Ann – Have a wonderful birthday! You deserve it. Thank you for always being so “real” and relatable. Best wishes! Very well said! Thank you for those reminders. I’ve struggled with just about all of those same things you have, and I appreciate your advice. Jerked to a Happy New Year living our best selves! Good thoughts, Ann. I will be 65 in a few months and I am making plans to retire after working at the same place for 32 years. I had a serious health scare this past June that resulted in heart surgery. I experienced a true “epiphany”at that time and I knew I had to make each day count. I must admit that although there is a huge part of me that looks forward to this new part of my life, I know I will miss the comfort of the everyday routine…the life I know. I am not looking at this time of my life as an ending, but the beginning of a new one. Enjoy your 60th birthday and here’s to many more! Thank you so much for this post Ann! I really needed it at this time in my life. I always love your blogs, but especially when my life life seems a little overwhelming. The tips, recipes, garden helps and art have such joy and warmth that I look forward to each and every one! You always make my day brighter! 100% spot on! The only problem I still have is asking for help. I ask my children but 99.9% of the time get “no, I’m busy”! So I just don’t ask anymore. Lol. I’m 61. Keep up your good work! I am anxious each day for your post! God bless! I turn 59 in a couple months, and your post really resonated with me. Not that it matters, but I agree with every word you wrote! I’m bookmarking this so I can re-read it often. Thanks for your honesty and insight Ann! I appreciated all you had to write and know that the best is yet to come for us all. Happy 60th! I could swear you wrote today’s post about me. We are at the same place in our lives and I’m feeling some of the same things. Thank you for giving me permission to slow down, just say no and let go……. Wise words, Ann. I will be 72 in April. I was 69 when I retired, mostly to care for my seriously ill daughter who passed away last March. I know I have commented about this before. Although I have experienced loss before, and it’s always been hard, this time it’s overwhelming. The day to day activities of living are often nearly impossible to complete. 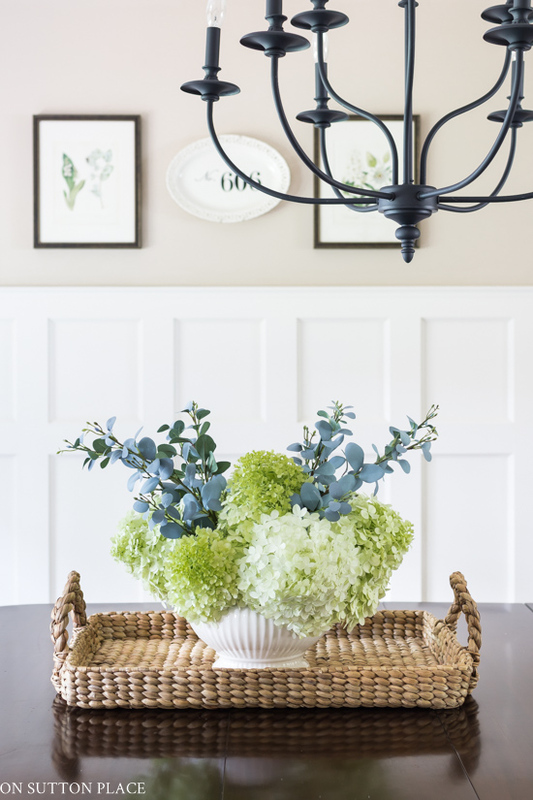 I am trying though and simple homekeeping and decorating does help. Your blog is so helpful – not that I try all your ideas – but your calm, down to earth style is a comfort. Keep it up! Happy 60th , Ann. At 68 I have learned all these things too. Thank you for putting them into such wonderful perspective. 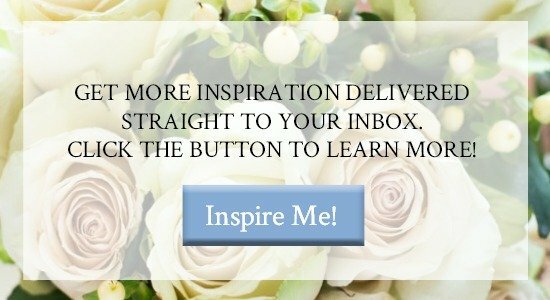 Beautiful blog post, Ann! And Happy Birthday. I filed this post under wisdom and under ageless. The 60’s are really wonderful. When you shake off the old-thinking (no pun lol) of what is old, etc – you realize we really are ageless in soul and spirit. Enjoy your 60’s and beyond, Ann. And thank you for lovely blog. Once again, one of your wise posts resonated with me. Ditto to all of it! One of the lessons of my life is that though many people come into one’s life, not everyone stays, and that is ok. There’d be room for nothing else if they did! Since my mom died a year ago, I have felt the absolute bliss of not having to go anywhere each day. I so enjoy being home. I was feeling guilty about it, but have decided to just embrace it instead. It is what i need right now. The wisdom of age, in part, is recognizing what we need and then giving that to ourselves. Early birthday wishes and welcome to a very important decade in your life. When I was 50, I thanked God for fifty years and asked for 20 more. About four years ago, my daughter said I should repray that, as I only had four years to go! Well, in September I turned 70 with a great big birthday party hosted by my children. Each day is a new gift, as I did not repray, just decided that each day would be a gift. I am keeping a copy of this blog, and may share points of it with some of my kids. Especially the friend part. You are wonderful, and happy birthday. I hope you get 20 more! I think this is my most favorite blog you have written. Great life lessons my friend. Happy 60. Such a refreshing sharing of the heart! At 64 I have experienced all of the changes you wrote about. I no longer feel the need to be a people pleaser and available to everyone that seems to ‘need me’. I have finally grown into the person I wish I had been all of my life. Learning to say NO was the greatest area of growth, and darn it, it feels good! No more guilt. Getting older isn’t for sissies but I’m loving the peace and comfort I finally have just being ME! I would say we are twins but I’m 13 years older.😀 You said this beautifully. You learned it much quicker than I did. I still sometimes feel guilty. You made me feel better just knowing someone else expressed the exact sentiments! Ann, I am where you are in the stages of life. I appreciate the eloquence with which you put into words what I have found to be true. Life is wonderful in a different way now, and celebrating that frees us from pointless longing for what once was. Thank you for this post! Your message was well received by me. I can relate to your tips and have experienced some of these changes myself. Asking for help is still difficult but I am getting more comfortable with the asking. I always thought I was strange that being a homebody was odd. Thank you for sharing you also like to stay home and that is part of your comfort zone. I love my home and like being in my home, my home is my happy place. Thank you so much for the tips and beautiful pictures. You know 60 is the new 40, right? I turned 64 last week and I wouldn’t change anything with my life. I retired 3 years ago and hubby just retired last year. The kids are all grown with kids of their own so it’s just the two of us here now. We’ve decided to get rid of what isn’t necessary and are going through a big purging – a cleansing if you will since we’ve lived in our house for 35 years – and it feels great. Since he retired from a major airline and we can fly for free for the most part, we can now finally travel without a time restriction. I do volunteer work, but I only do what I want to do. I only keep in touch with a few people that I worked with, so those friendships are quality. I’m very happy and feel very blessed with my life. 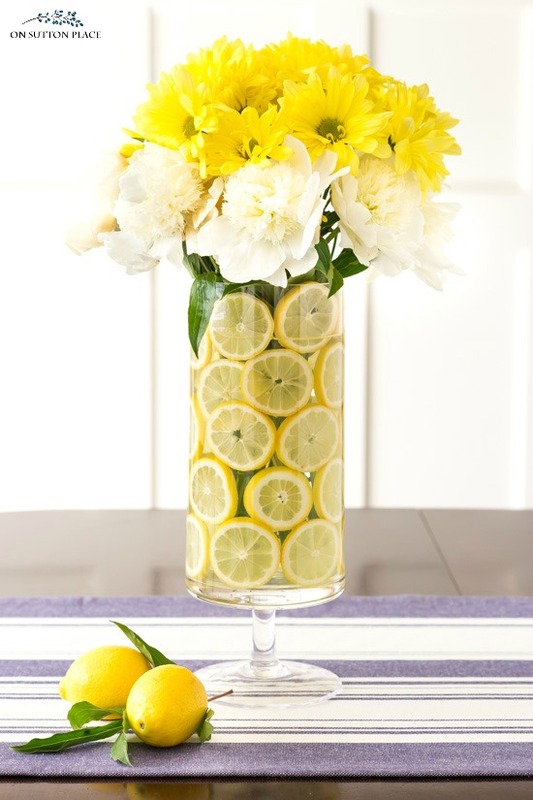 By the way, I am hosting cooking club today and saw your lemon and flower centerpiece – that’s what I was going to do with my flowers today. Have a happy 60th birthday. Happy birthday, Ann! You gave us the present today with this thoughtful post. Thank you for sharing! Well said! I learned through my Mother’s illness to self care. I had to stay healthy and rested so I could give her care. Tough lesson learned but now I actually make sure I take care of me so I can say “yes” to the things that are important in my life. You are so right in everything you have written. It’s all so important to realize and it’s wonderful that you have shared. As we get older we tend to beat ourselves up in so many areas. Taking too long to do things and getting upset about things that won’t matter this time next week. It’s also important to learn to accept others as they are and because they don’t do what we think they should do doesn’t make the wrong. Loved your blog today. Life can be difficult at times but we have to learn to make the best of all situations. I try to keep a positive attitude and don’t let small things get to me. At 72 I feel like like a stronger person and never take anything for granted love spending time with family and cherish each day. Treat people with respect and be be kind. You will be a happier person. Early Happy Birthday – All you say is so true. Although it took me 10 years longer to learn it. Good morning. Thank you for writing and sharing your heart. I hope this is your best birthday yet. Thank you for sharing your wisdoms with all of us. I am a year behind you but am also coming to realize that I can live my life my way and that’s ok. My husband and I just celebrated our 40th wedding anniversary and made an agreement during our trip that the rest of our lives is for us! Thank you for your wonderful blog and your friendship to all your readers. Ann, your sentiments above are so true. I will be 65 this year and I retired at 59 after working at the same place for almost 35 years. Some friendships that developed have gone by the wayside; however, one has become my sister by another mother and means the world to me! Things slow down but I now have time to truly enjoy life, enjoy the beauty of the earth and all the wonderful things God has created. God bless you, Ann. You are extremely talented and I appreciate you sharing all your insites, recipes, and designs with your followers. You are one in a million! Like so many times with your blog, I want to say I love this article. But this one has to be the very best. I am 63 and have learned so very much from your blog. I 100% agree with everything you have said here. I’ve experienced the same thoughts and feelings; so glad to know that someone I admire has said the same things. God bless you in the years ahead! I hope you will continue to share your talents with us. Love this post Ann! I don’t talk about age much as I feel that it’s just a number, but sometimes think that the years are passing by too quickly! That being said I’m already into my 60’s and am happy where I am and would never want to go back emotionally to where I was in my younger days. Of course the slowing down, the minor aches and pains and much of what you mentioned is there…but one foot carefully in front of the other. I too will be 60 this year and if I had written this post it would have been these exact same lessons I shared 😊…Maybe that is why I love your blog so much…seems we think very much alike! breath deep, one step forward, breath, one stop forward……. I think this is actually one of my most favorite posts ever. It spoke to me, maybe because I’m turning 60 in April. I’ve been looking at my future through different eyes. I’ve had to try to figure out “who am I” at this age, something I never did in my younger years. And I agree with all the points you made. I want to thank you for this post. And happy soon to be 60th birthday. I will be 50 this month. Married, work full time, own a home and a camp, have one grandchild with another on the way, aging parents and in laws…I feel overwhelmed at times. I appreciate your post and will try saying no more often haha! I have read your blog for years but this is my first comment – I so appreciate your words of wisdom. Thank you! Preach it, sister! I love these observaions – so inspiring Ann. I’m a few years behind you, but definitely looking at 60. :) Thank you for going out on a limb and reminding us what is really important! I love this post! I am 45 and have realized I can’t keep up with things the way I used to. Arthritis is not helping in that department either! This has given me the blues many times but I am going to take your advice and accept this as part of life now. I am more likely to accept help from my husband and sons these days instead of trying to do it all myself. A step in the right direction :) ! Thank you for those very wise words. Great post Ann. I am 6 yrs older than you. I agree with all that you said and will add one of my own. I no longer fret about my hair, clothes, body etc. Don’t get me wrong, I look presentable but I don’t let a bad hair day get to me or worry about having the “right” clothes. I stopped coloring my hair & pared down my wardrobe. I know what I am comfortable wearing & if it is not on trend, so what. 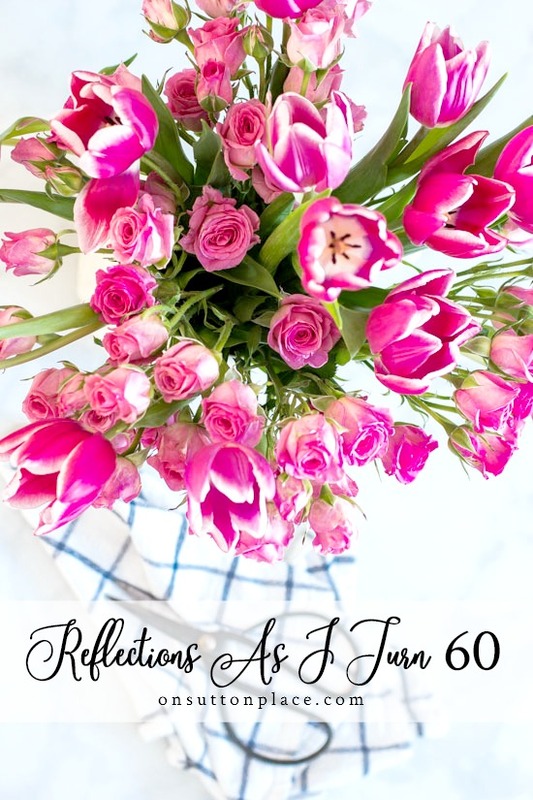 Amazing heartfelt reflections as you look forward to turning 60! Thank you for these subtle reminders. P.S. By the way, the 60’s. . .you’re going to “like” it here! Hi Ann – Enjoy your birthday and the sweet freedom of being older! I was reluctant to retire from my job as a school librarian, but I could see the time had come. My husband retired the day after me and that was 2 years ago this month. I will be 64 this year and I love your post because it has taken me a little while to get to the point where: 1) Yes, love the people I worked with, communicate with technology, but realize that it will never be the way it was 2) Slow down and that is ok – we live in an active adult community ( downsized soon after retiring) and there are many options for exercise, education, social life, entertainment…and our first year here we did EVERYTHING. Too much – now we are able to say 3) No. And stay home, and read, and watch movies…and enjoy our home. We volunteer a little, and enjoy that very much….travel, too. No children, so no grandchildren….but agree with what others are saying. This is a great time in life….and it will pass, too – so I am enjoying it and embracing it! Love your blog – thanks for all the great recipes and ideas! Such good advice, Ann. I am 62 and have been retired from teaching for over two years. I no longer want to serve on committees or leave my home at night for meetings. Been there, done that for over 36 years! My husband, also a retired teacher, feels the same. We laugh that we can be fair-weather fans after sitting through rain, wind, and snow while our sons played sports. We’ve also found that we now have little in common with friends who are still teaching; apparently our jobs were the only things that held us together. We’ve moved on with a small group who also enjoys eating out, golfing, and traveling. We’re looking forward to the birth of our first grandchild. Getting older isn’t all bad! Thanks for a great post that puts it all in perspective! Agree, Barb! After being a librarian for almost 40 years I no longer want to be on committees or be “in charge”. Am part of a library group in our apartment building and when asked to do more I say no. Also agree…keep in touch and see some of my former school friends…but life moves on – and it is great ! Ann, I totally agree with your perspectives on getting older and looking back on life. I feel very blessed at 70. I have enjoyed meeting you and your family through your blog. I turned 60 last year, just had my 61st Birthday earlier this month. Every thing you wrote is true, letting go of guilt, work friends ( I worked at my daughters school district for years ), forgiveness, time to breathe for yourself. I have read your blog for years and will continue on:). I’m enjoying this season of being a Grandma and I’m sure you are too!:). Say hi to Kelly for me! :).